Another Great Moment in Cycling. It's that moment we love so much here on Cycle Chic. Green light. Muscles tense. Bicycle propelled forward. Momentum achieved. Continue on. And look frightfully fashionable while doing so. Ah, Copenhagen. Any ideas for what this magical moment could be called? The initial thrust off the light? We've discussed it here at the blog, but couldn't come up with a fine, good name for it. Musical ride. 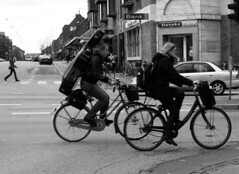 Copenhagen cellos prefer being transported by bike. We've asked them. 9 out of 10 confirmed it. Red Bag, Red Coat. Both heading home on the bike lanes. 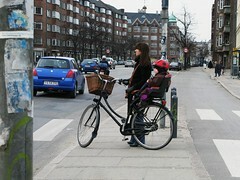 Yet another Copenhagen supermum. Superstylish. Supercool. Super mum. When will you upload a video about copenhague cycle chic making of?? 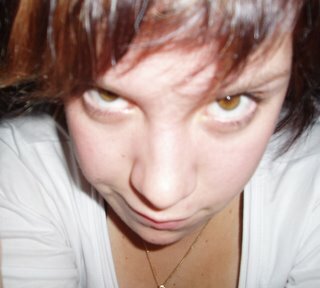 I am very interesting about ! Why is that, to be chic, the bike must be retro, with the rider a petit girl wearing over sized sun glasses and red heals? True this is very chic but let me give you another scenario; A male ridding a present day road bike (no tassels, high heals, or basket) with a French Riviera backdrop. Sounds chic with a masculine, sporty twist…right? Different cycling style from here, in Japan. Look nicer overthere. I, myself, hate cycling. Really! But who knows, maybe someday, I won't have choice... ANyway really good looking blog would almost make me want to ride! i must say Copenhagen is a hell of a place. This is definitely best way to cure things like fossil fuel depletion and global warming, cycling with style makes more attractive than other things. thanks for all your comments and welcome to all the new readers. Chic isn't just women. Men can be just as chic. The Offy - great one! Yellow light, red light, chic! - another good offering. As I can see on the photos, Copenhagen bear resemblance to Budapest's beautiful buildings. I usually bike not in the city but in the countryside. wow, i never thought fashion would go with bike :D i love the photos! These retro bikes are great for tooling around.Used to have one. Love this blog, I am into cycling, and though I live in the northeastern US, the we are Cycle Chic! Those black and white photos are really striking! There's a sculpture in Manchester (UK) called 'The B of the Bang'- http://www.bofthebang.com/. The British sprinter Linford Christie claimed that was the moment he left the blocks. Will sleep on it. Perhaps something better will bubble up. lovely photography, nice to read about something in Copenhagen that isn't about weed, prostitution or jihadists. pretty cool blog...never would have thought I had a fetish for classy ladies on bicycles. Lissen up Zak, don't be letting all the compliments go to your head now. Ya need to keep your focus as "Bike Advocacy in High Heels", ie: girls on bikes. What happened Zak? Did your site get featured on the cover of Vogue? It would seem so from the amount of comments recently. I'm glad for more readers and hopefully chic cyclists. samuel: i heard we got mentioned on Blogs of Note at Blogger.com. Right, I'm linking to this on my blog. Hope that's okay. Not only is it a great photography site, but I love bikes!